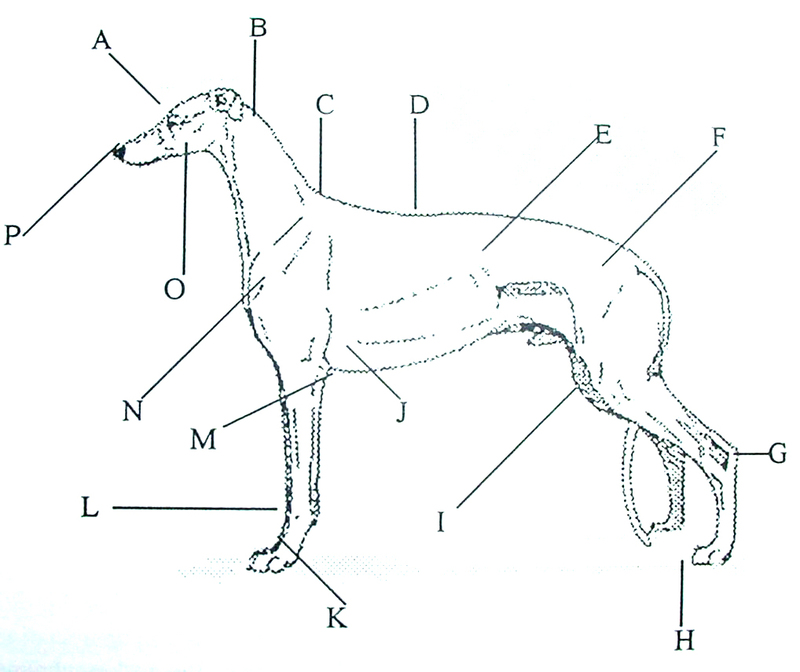 The following list shows the correct terminology when referring to the greyhound anatomy – to be used when talking with veterinarians and dog “knowledgeable” people (See list 1). There is another way to define the greyhound anatomy as well – the day to day way when you live with one of these lovable creatures. (See below and right) Please note—to determine your dog’s height you measure from the floor to the shoulder (withers). Eye: Doe-like, capable of conning the average owner out of half the food on his plate. Can convince the owner of total innocence even though the New York Times lays shredded on the bed. Ears: Capable of hearing a can opener a mile away. Can never make up their minds if they should be back, up, down or sideways. Mouth: From it come smiles, chatters, barks, whimpers and whines. Can inhale edibles in a flash. Brain: Constantly looking for trouble to get into. Wheels always spinning and turning. Crest: The part of the neck that is supposed to stop the collar before it shoots over the greyhound’s head. Withers: Where you’re supposed to measure the dog’s height if he’ll stand still long enough. Shoulder: The envy of Mr. America. Tush: Potent exhaust system. Usually presented to humans for scratching. Tail: Whip – deadly for anything at coffee table height. When it makes contact with skin, it can bring a grown man to tears. Hock: Pointy thing on back of leg. Chest & Waist: What most people would kill for. Waist thickens with age. Toes: Dirt and mud collectors. ALL RIGHTS RESERVED This article and its artwork is not available for reprinting or reposting.